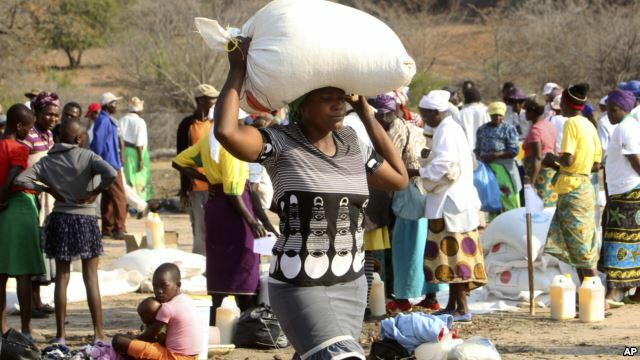 ZIMBABWE – Zimbabwe on Tuesday appealed to local businesses and charities for $1.6bn aid to save more than a quarter of the population from starvation due to drought. “The government of Zimbabwe requires a total of $1,57m with effect from February to December 2016,” Zimbabwean Vice-President Emmerson Mnangagwa told a news conference in the capital, Harare. The figure includes nearly $720m to pay for 1.4-million tonnes of grain imports from February to December, with money also needed for irrigation infrastructure and a nutrition programme for young children, Mr Mnangagwa said. Mr Mnangagwa’s appeal comes barely a week after President Robert Mugabe declared a “state of disaster” in many rural areas hit by severe drought. Zimbabwe has been affected by a regional drought worsened by the El Nino weather phenomenon that has also affected other southern Africa countries including SA, Malawi and Zambia. Mr Mnangagwa said the southern parts of the country were the worst affected with tens of thousands of cattle dying, boreholes drying-up and dam levels are decreasing due to the poor rains. Most of the funding is sought for the import of foodstuffs but part of the $1.6bn will be used to repair irrigation equipment across the country to increase food production. Formerly known as the breadbasket of Africa, Zimbabwe has suffered perennial shortages in recent years and has relied on importing grain from neighbouring countries to meet its needs. Mr Mugabe has blamed the low farm yields on erratic rains due to climate change, as well as sanctions imposed by Western countries over his government’s tainted human rights record. Critics say the food shortages have been partially caused by the president’s land reforms enacted since 2000 when the government oversaw the often violent eviction of white farmers. The economy shrank nearly 50% between 1999 and 2008, blamed on economic mismanagement by Mr Mugabe’s government. Many farms are now underutilised, and the government has vowed to hold an audit to ensure agriculture land is put into production.